I don’t think anyone’s more of a sucker for a good deal than I am. That’s why I love grocery shopping at the Commissary. Everything is already super cheap, plus they leave coupons out for you everywhere, and have great sales. 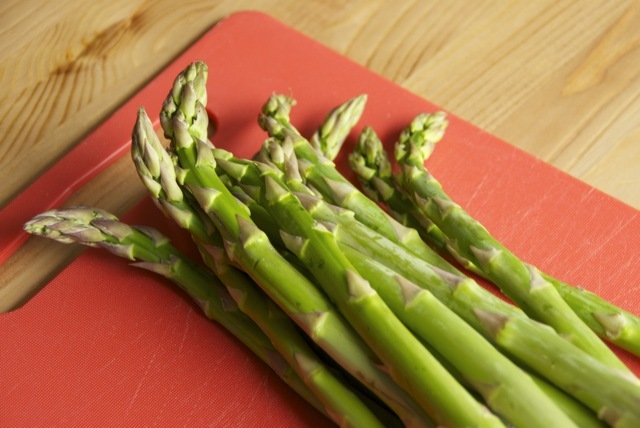 This week, Nick’s favorite veggie was on sale: asparagus! Besides being a really great deal, they were huge and looked awesome! I already had dinner planned for tonight, so I thought about how I could incorporate them into brunch. Omelettes would have been an easy way to go, but I had a lot asparagus, so I wanted to find something that would reheat well for Nick’s breakfasts during the week. 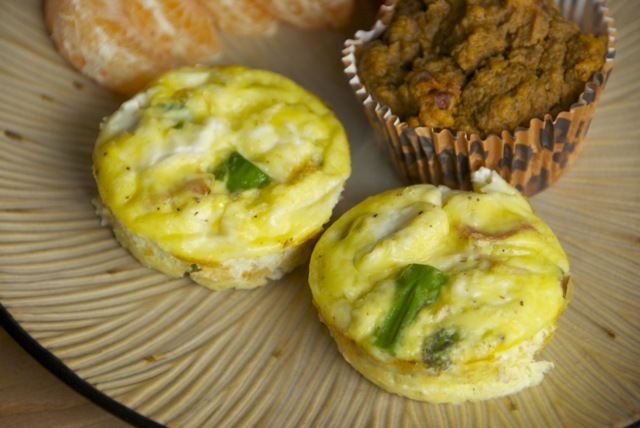 Mini fritattas were the perfect solution! The recipe is loosely based on one from Giada DeLaurentis. A couple of Nick’s other favorites went into the mix too. 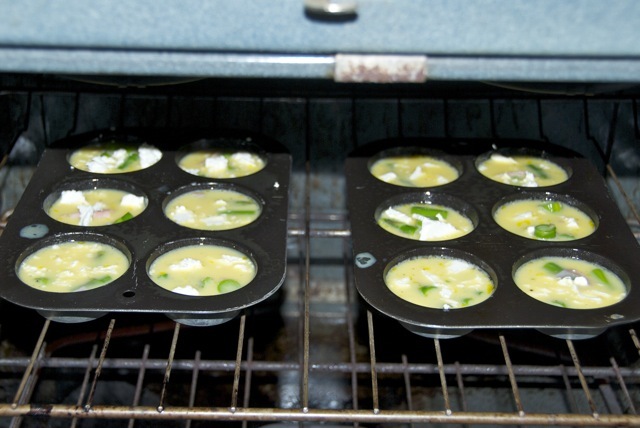 Preheat the oven to 350 degrees and spray muffin tins with nonstick spray. 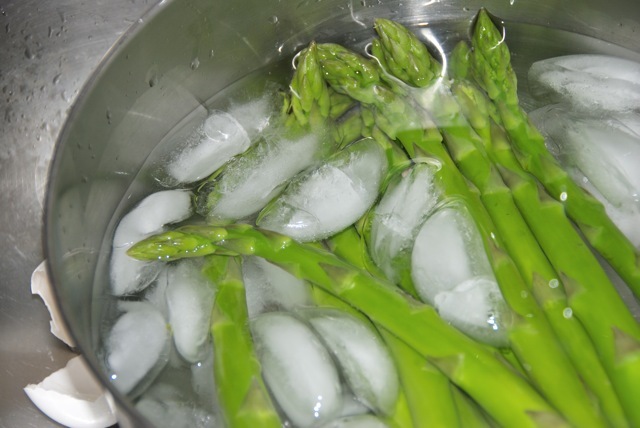 Boil some water and blanche the asparagus. 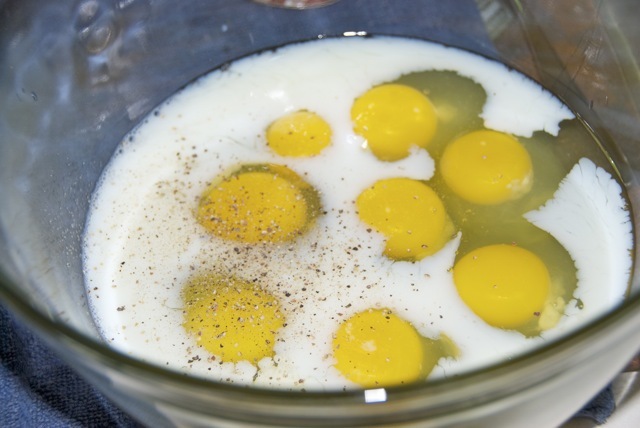 Beat the eggs, milk, salt and pepper together. 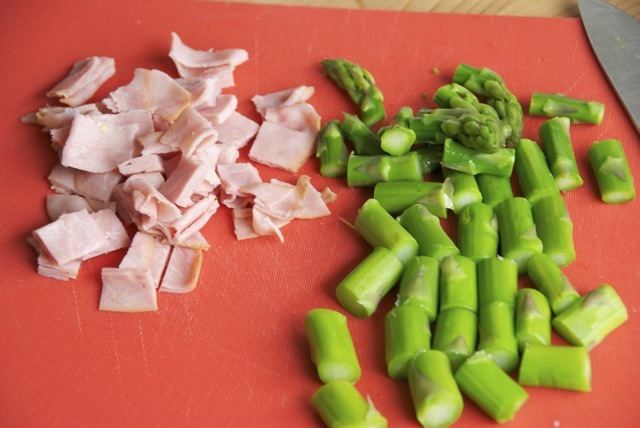 Chop up the asparagus and ham. 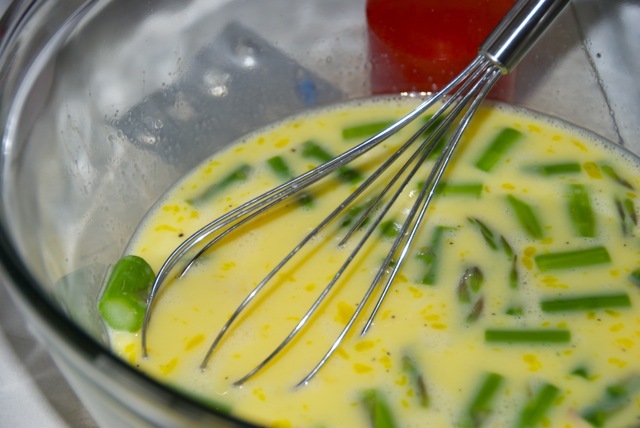 And mix them in with the egg mixture. Bake about 18 minutes or until they are set in the middle and just slightly brown. 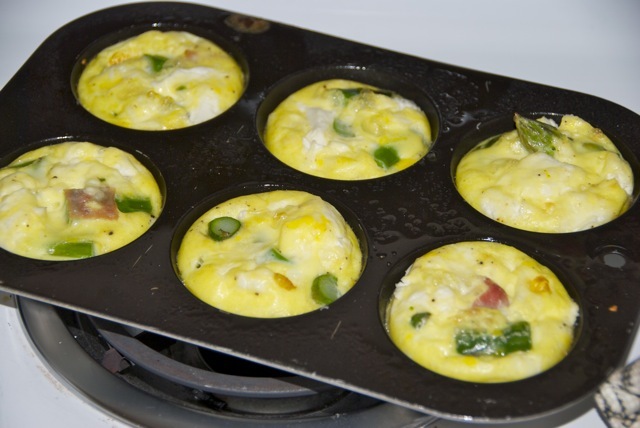 Slide a knife or rubber spatula around the sides to coax the frittatas out of the pan. Mine were a little sticky, so next time I’ll be sure to be extra generous with the nonstick spray. 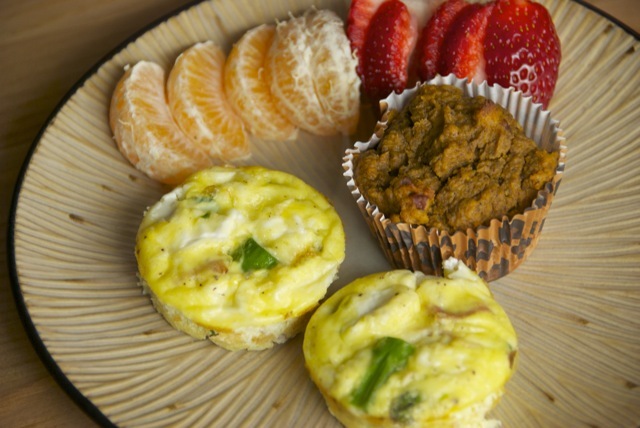 We had the frittatas with coffee, oj, some fruit and my favorite pumpkin muffins. Perfect Sunday brunch! 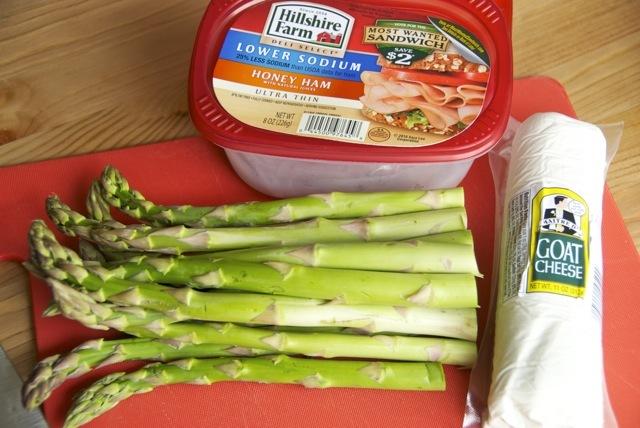 The flavor combo of the asparagus with the salty ham and tangy goat cheese was perfect. I’ll definitely be making these again! This looks so delicious. 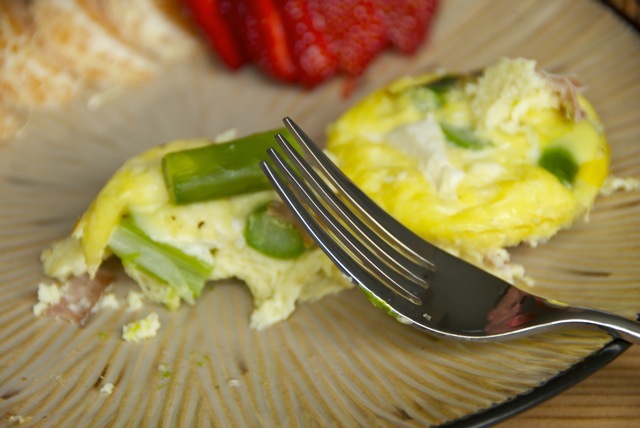 My go-to ‘breakfast for dinner’ is always an asparagus & ham omelet, but I’ve never thought of using goat cheese… omg, yum. These look great. I bet they taste amazing. 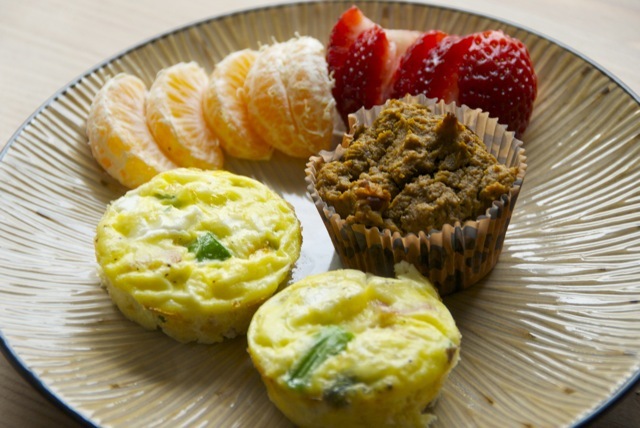 They look absolutely delicious and seem to be so easy to make. I’m going to give it a try though I need to change a few ingredients (asparagus and goat cheese are both expensive imported items in Bali). I cannot wait to try these this weekend! They look ah-mazing (as does everything). Also, you’ve inspired me to photo-document my own cooking exploits-_ maybe I’ll remember what I actually put in things now, haha.